Because the pods are vacuum sealed they last for at least two years. Reserved online, went to the store looked at the display model. Hmmmmm not so sure, shame the black wasn’t the same price. As the man said in the orthopedic shoes, i stand corrected. Thanks OP; I picked mine up yesterday. The reason for the reduction is that the coffees have a best before date of end April 2019. I was impressed that the sales assistant pointed that out to me before I paid. I prefer a larger coffee, and this is a step up from the Dolce Gusto machine I'd used previously. As I said I really like the lungo. The flavour is great, with espresso beans you get an interesting flavour that you can't really get with filter or espresso machine. The 7g espressos are really nice too. Not so sure about the bigger 230ml ones, they are 14G of coffee and they are OK. Refilling them didn't work that well for me, because I think you need a different grind so the extra volume of water can get through the extra volume of beans. Sadly most of my free 10 boxes were the larger size. Apparently Vertuo has been out in the USA for a while are were intended to be more like filter coffee which is the favourite coffee over there rather than espresso. 10 grams per cup is about right for filter coffee. If you look at the boxes, it tells you the net weight, you can divide by the number of capsules to get the weight of coffee in each capsule. It's quite possible that even for the same size, different types of bean/roast have different weights. Because I'm refilling them, I also cut one of mine open before use to check the grind and smell, and the amount of space in the capsule (they rattle a bit when you shake them). At that point I weighed the amount of coffee inside and it was just under 10 grams. I couldn't find much info about the amount of coffee in these, someone on Reddit said 12.5g but obviously that's not official. Piano red. Lol. Such a common colour for a piano. 'These guys' as in Currys PC World or Nespresso? :/ Either way, this machine uses Vertuo capsules, not the classic ones and these are only available by Nespresso. A vertuo machine for a great price. Comes with free 120 capsules as well! I thought this was a great price. Vertue is nothing more special than original line, Only that pods cost double for twice the size of Cup. Plus you're forced to use nespresso branded capsules. It's still live at ao.com. Lattissima is part of the other type of capsule that Nespresso sell. Most who have tried both seem to prefer these vertuo capsules but I suppose the Lattissima has the milk jug. Having had a milk jug on a previous bean to cup machine I am not really that bothered - milk gets old, have to wash it, takes space in fridge etc. Lattissima one was £99 at amazon until last night, That's a million times better offer than vertue. Ordered one. Best deal out there for a Magimix by far. Done some technical / video research on these v Cusineart, Kenwood, Bosch etc. alternatives. Then visited stores. Decided to go for this based on dual bowl, very long motor guarantee (30 years - yes thirty), review of how well they actually work and fact the entry slot is large enough to accommodate most veg without having to cut up to fit. Surprised this hasn't gone hotter.thanks KateShaw. ps note this is the Debenhams special so its a standard size feed lid and not the Magimix 3200XL (extra large) feed lid. Collected used mine todayMonday 31st) works really, really well. 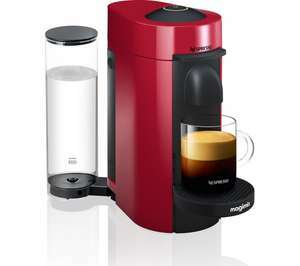 Cold from me as John Lewis price is £120 for all the Vertuo plus models and £179 inc the Aeroccino milk frother. Lidl do an amazing Lungo plus other varieties that tick the box for me. There are also ‘other’ independents who sell their version on eBay or direct so there is choice. All in the same compatible pod. Back to this machine. Does anyone have it and any user feedback. My machine of 3 years died this morning.....RIP. I've tried some of the Starbucks capsules &amp; they weren't for me. To be honest, when the price per coffee is only 10-15p more, I'm happy to stick to Nespresso. In reality I don't pay anything like face value because I have a subscription &amp; sell the £1 machine every year. I've just done the maths for the 1st time &amp; realised that I'm paying about 25p anyway! Just don't. We've had one of these for a couple of years, not in that vile fuchsia though. It's quite a beautiful object in all stainless steel, but not good as a toaster. Form over function. The problem is that it really only does one piece of toast at a time, unless you have the smallest of loaves. If you're on your own that's OK, and it's pleasing to look at (do I have a sad life?) To answer Rich44, the windows have stayed transparent for all the time we've had it. Perfect post, nothing more needs to be said!! For that kind of money I'd expect it to toast weather images &amp; twitter feed updates! I've emailed Amazon and asked what I can do as they just sent me a generic email. No customer service! My order also cancelled this morning Whats the next step? I contacted Amazon about the cancellation and the agent offered to price match with a Magimix of a different colour. It took a bit of legwork and an email to the Customer Services Director but they honoured that because apparently offering the match was a mistake on their part. Still, I have a Satin one now that cost £128; could be worth pursuing through chat. I also have the Pro my 5 machine... and love it been using Nespresso for over 10 year. They are recyclable. No harm for environment. Decent looking deal from John Lewis in the clearance that went live @ 8pm. KidStart are also giving 3% on John Lewis orders. That would be interesting given Krups and Magimix machines are made in the same factory to the same spec. The differences are cosmetic, namely the external colour choices, and external styling changes, and of course may play on brand loyalty, Krups as a brand is German in origin, whereas Magimix is French. From reading reviews on Amazon it seems the Krups one (white and red models) is better made than the black one from Magimix. Great little machine especially at this price. (y) The same deal is available from John Lewis (with free collection from Waitrose stores). Club reward of £40 is available for purchases upto 31st may. Buy anything from Nespresso.com (a machine, pods, cups, chocolate bars, etc) or use it for Nespresso cafe. Good point, "Genuine" Netspresso pods vary from 30p or so up to £1 a pod, and I know there is the cheaper end as Nestle's patentsn expired so the cloines could flood the market, However if your buying one of these machines your in it for decent coffee so there little point buying too cheaply :) If you only want the occasional coffee then as the pods are sealed and stay fresh for ages then these pod coffee machines are a great coffee solution, if you drink a lot of coffee the cost will add up grinding (or even roasting) you own beans is cheaper.. The pods can be had for about 8p each if you shop around a bit. That said they won't be the 'proper' ones. I have this exact machine and it's alright in a morning for a quick easy espresso but I much prefer a AeroPress with good beans. If your machine is making ANY noise while heating, there is something seriously wrong with it! It should be totally silent while heating and only make noise 20 seconds later when the pump starts. Sure you aren't talking about the pump ? Yeah just checked the Ts and Cs - looks like just £60 of credit. Still only £40 worth of coffee in the real world but makes it a decent deal if you have an outlet for the aeroccino. Expired. These nespresso deals never seem to last long. https://www.amazon.co.uk/gp/product/B01MUBKVHN/ https://www.johnlewis.com/nespresso-essenza-mini-coffee-machine-with-aeroccino-by-krups-black/p3188354 This is £82.99 on John Lewis and Amazon. Yes, L'Or are aluminium pods. Not a huge range but £2 for 10 when they are on sale (often) and £3 usually. Cheaper in bulk online. They taste good and even look much better than others. I never had a problem with the plastic ones myself. I have used Cafepod and they work fine. Not sure what you mean by excellent? I have tried many alternatives including the Dualit versions. The vast majority are plastic and crack in the machine. I haven't tried L`OR, but are they aluminium pods? The other issues with plastic is the non-recyclable nature of the pods. There are some excellent compatible Nespresso pods on amazon and even in supermarkets - L'OR are brilliant and Gourmesso are also very good. Nespresso all the way... They also do decaf pods of course. If you can, wait for the coffee credit to come back on. 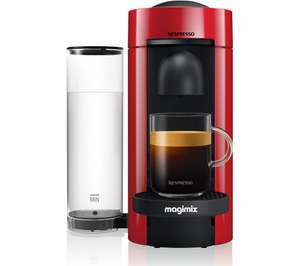 I bought this machine for £45 with £45 worth of coffee that comes in 3 X £15 vouchers to use on the Nespresso website. I’m looking to buy my first Nespresso machine. Should I buy this or should I wait for the slightly higher end ones to come on offer. Got the exact same machine and really pleased with it and Nespresso capsules. I would say the temperature of the coffee is more than hot enough and probably the 'correct' temp. The range of Nespresso capsules is great and usually has something for everyone. The machine is a little on the noisy side but not overly loud or concerning imho and it doesn't take long to brew a cup. Me neither. How to activate the offer?